Platform.sh supports building multiple applications per project (for example RESTful web services with a front-end, or a main website and a blog). For resource allocation reasons, however, that is not supported on Standard plan. All of the applications share a common configuration through the files present in the .platform/ folder at the root of the Git repository. Then each application provides its own configuration via the .platform.app.yaml file. When you push via Git, Platform.sh will build each application separately. Only the application(s) that have been modified will be rebuilt. To create a multi-application setup put each application in its own directory with a .platform.app.yaml file at its root. Platform.sh supports Git submodules, so each application can be in a separate repository. This is a powerful feature which allows you to create a Staging server with different versions of each application in a single commit. # Or app1-submodule/path/to/webroot, if appropriate. http://example.com/ and all the urls below it to be served by the AngularJS one. You can SSH in any application that is deployed. Here is a more detailed and complete example for a project that is designed with a micro-service architecture. The front does not connect directly to the database but does everything through these APIs, and it uses Redis as a Cache. note There is no relationship between the directory names and the application names, which are defined in the configuration files. In our use case the User API is accessible through a URL like https://api.example.com/v1/users, and the Content API is accessible through https://api.example.com/v1/content. In this case we are not doing HTTP caching on the two APIs, but we are caching on the front application. 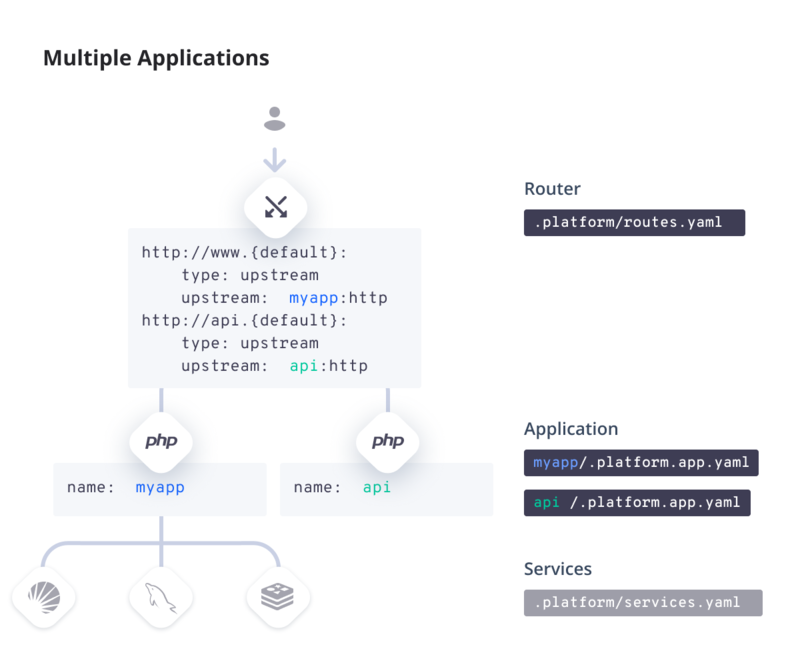 For the later, we simply tell our router to connect, to a service called front and route HTTP traffic to the application service running there. Here we define two services that could be available to any application in the project. The keys commondb and cache are names (need to be alphanumeric with no special characters) which describe the role theses services will have in the project. We use these names in each application&apos;s .platform.app.yaml to link the service to the application. The commondb comes from the name we put in services.yaml. The :postgresql suffix, which is required, is there because in the future Platform.sh will support multiple endpoints per service (for services that support multiple protocols). See the Services section. note The name database is freely chosen by us and will be exposed in the environment variable PLATFORM_RELATIONSHIPS of the application (it can be different between the different application of the same project). These relationships allow an application to connect to another, and will expose in its environment variables everything that is needed for it to be used dynamically in its configuration. note The names database, user_service and content_service are freely chosen by us. It&apos;s often better to stick to a simple naming scheme.